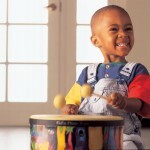 Once your child is 3 – 4 years old, he or she will likely become a question box! “Mom, why is the sky blue?, Why do I have to wear shoes?” With so much curiosity how are you helping your child take advantage of all the learning around him or her? He wants to try things on his own, create her own songs, pretend to be a knight with his friends, or see how high she can jump. 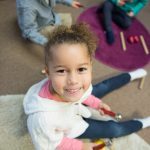 Kindermusik for 3’s and 4’s provides your preschooler with the musical, movement, and language stimuli to engage them in imaginative play that fuels their curiosity, encourages tuneful singing, and supports their growing independence. Kindermu sik Laugh and Learn takes the preschooler (ages 3-4 years) on a musical journey of discovery and exploration…a journey limited only by the power of imagination. Pretend play activities are integrated with music, vocal development, storytelling, movement, and literature to capture the preschooler’s potential to learn and to encourage cognitive and literacy skills, creativity and individuality. Designed for active, energetic, enthusiastic, and imaginative children ages 3 to 4. classes encourage socialization, sharing, and participating in group activities. Singing becomes a focus for enhancing the preschooler’s vocal development as expressive language is just beginning to emerge. The parent and child have fun participating together in the last 10-15 minutes of class during Sharing Time, where they’ll also learn about Home Activities they can enjoy together throughout the week. Your Child Will Love Laugh and Learn, Learn More!